Introduction: If you're looking for a quality reel that's packed with features at an affordable price, then look no further. TICA offers many incredible products in your budget range that perform like many reels costing twice as much. We take a closer look at one of TICA's top sellers, the all new Libra. About TICA: Established in 1965, Ever Winner Industrial Fishing Tackle Co., the parent company of TICA, is one of the biggest fishing reel manufacturers worldwide. For decades they have been OEM manufacturing and now with their expertise, they have created their own brand products under the name TICA. Today TICA's advantages come in competitive pricing but with more features and the same quality as premium reels that cost a lot more. TICA offers a complete range of spinning reels, baitcasting reels, and rods. Well known worldwide, TICA continues to grow as they continue to introduce quality products that are amazingly affordable. Impressions: The TICA Libra has been on the market for a couple of years now, but the one we're looking at is all new. The 2nd generation TICA Libra is reintroduced with additional improvements. Here are the differences: an increased drag size, new rotor and bail design, and a spool with ported holes for weight reduction. 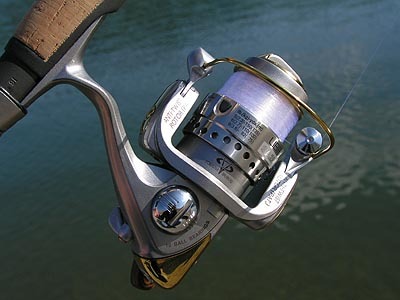 The Libra is a very attractive spinning reel that's feature packed for an incredible price. Starting from the top, the SA2500 sports an anti-twist titanium plated line roller with a mini bearing; some people always wonder where a manufacturer can pack this many bearings, and this is one place that can hold one. Next there's the forged aluminum spool with a stainless steel titanium plated lip that's placed on a computer designed balanced rotor to minimizes vibration. The handle has a one-touch button for quick fold-up and sports a luxurious wooden handle knob that's packed with 2 ball bearings. And there's more! Enclosed in a high-tensile strength plastic body, there are more bearings summing up to a total of 10 precision ball bearings, 1 roller bearing that provides an Instant anti-reverse system, and attractive gold and silver trim treatment. Real World Tests: A great sized reel for those who want small but not ultralight. 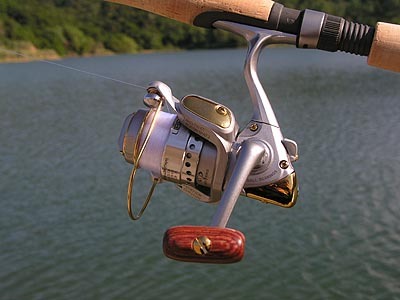 This reel is quite versatile in the types of fishing it can be applied towards. With this many features incorporated into the TICA Libra, I couldn't wait to field test it on different species such as crappie, rainbow trout, and largemouth bass. Casting: The TICA SA2500 looks and feels great, but when it comes to casting, it's not exactly the best out there. Casting the TICA Libra is just ok and that's due to one thing, the spool diameter. Yes, a thinner spool would allow the line to flow off much quicker allowing you to cast further, but the problem is that the thinner spool also causes more frequent coils when the line comes off the spool, thus the line do not shoot through the guides straight. While testing with 6lb. test casting was fair and I was able to toss a size 1/16oz Kastmaster pretty far even due to the line coming off too fast with spirals, but as the line size went lower, casting improved. Casting with 4lb. test was much further than 6lb. A fishing line like the Sufix DNA that's extra limp definitely helps when the spool diameter is smaller. Design features that improve the casting distance on the TICA Libra comes from the worm shaft, line roller guide, and having an overall balanced reel. With an accurate worm shaft system the oscillations of the spool is consistent each and every time allowing the line to be laid back onto the spool evenly during retrieval. This is important because for distant casting it's crucial to have the line come off smoothly. The Libra has a line roller with a mini bearing inside instead of a bushing. The line roller on the SA2500 also improves casting performance because a good line roller reduces line twists. Similar to a precise worm shaft system, having a balanced reel is a must because it can cause problems if the reel wobbles and creates slack spots that compromise casting distance and can cause many problems while casting. The TICA Libra is designed using their new high-tech computerized system to ensure the rotor and handle is balanced, reducing any problems it might give to the fishing line and also enhanced the smoothness during retrieving. Retrieving: Don't let the casting portion put any negative thoughts in your head. The Libra is still a great reel and in the retrieving category, it would have to receive no less than excellent! Packed with 10 ball bearings that are used in critical motion points, the TICA SA2500 is amazingly smooth. Just crank it and you will fall in love with how nice it feels. The line roller has a mini bearing that allows fluid line retrieval and the handle knob contains two more ball bearings for added flow when cranking. 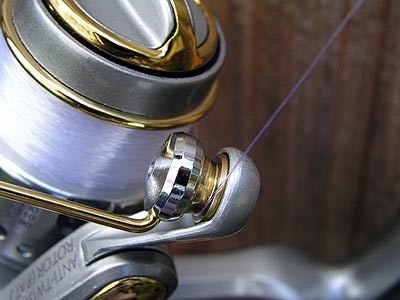 Yes, the reel has many ball bearings, but other components on the Libra contributes to the smoothness such as the computerized balanced rotor, that's only on the 2nd generation reel, and handle design that minimizes any vibration. A worm shaft system that's precisely cut means that each and every turn of the handle rotates the gears, rotor, and spool consistently at all times. Ultra-smooth with 10 ball bearings, the SA2500 feels great! The Libra is also powerful. The frame of the SA2500 is constructed of high-tensile plastic that has zero give when fighting larger fish and with each turn of the handle the gears roll efficiently, allowing all the energy to be transferred into bringing the fish in. The Instant anti-reverse system to the SA2500 is stunning. No back play is exhibited in this reel and it provides a solid hookset each and every time. 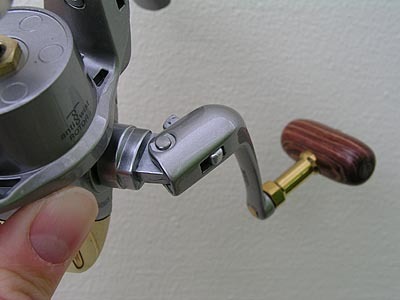 The Drag: Most fishing situations require a smooth drag with small precise incremental adjustments. When fighting hard hitting and fast running fish, having the TICA Libra's fine drag in hand puts you one step ahead of the game. Even though you won't get complete lockdown with the drag at max (torquing with you hands, not the line), there are a couple of points on the SA2500 that makes the Libra drag outstanding. First the ability to finely adjust the level of pressure it applies on the newly increased drag system, providing just the right amount of pressure while battling fish. Also, this is something rare, but the Libra incorporates two ball bearings on the shaft to provide smoothness as the spool turns in the opposite direction feeding line off as the fish makes dashing runs. With each pull, the line is extracted from the spool smooth and consistent, and a wide enough range of pressure to prevent big fish from taking control of the situation. Warranty: TICA provides a 1 year limited warranty to all their products and the best thing is, you won't have to worry about not being able to find parts or a service center. TICA is located worldwide and it's simple to get service if needed. Conclusion: Reels of today come in a wide range of sizes and of course a sticker price of anything from $20 to over $100. The TICA Libra was designed and manufactured with one goal in mind, to deliver a more competitive pricing with the luxuries found in more expensive products. Those looking for a combination of quality, reliability, and many useful features that come in an affordable package, should take a look at the TICA Libra. The SA2500 reel has a smooth retrieve, good drag system, attractive features, and quality that can compete with reels well above $100. If that's what you're looking for, then TICA is your brand.